Our experience actually began in September, 2013, when my office was approached to provide surveying instruction to Dr. Eugenia Robinson, a Professor of Anthropology at Montgomery College in Maryland. Dr. Robinson has been a summer resident of Rhode Island for most of her life so the logistics were not as daunting as one might initially think. 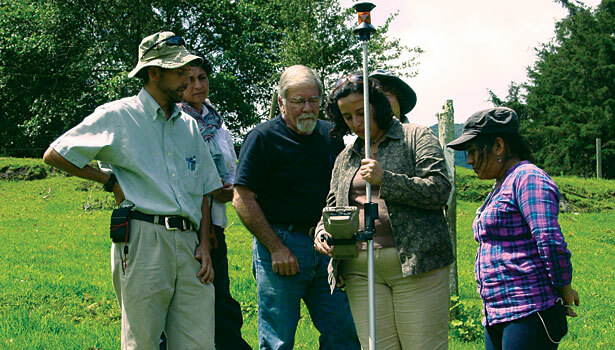 Over the course of the next few months, we met a number of times with Dr. Robinson and her husband, Dr. Alfred Bartlett, to instruct them in the use and operation of robotic surveying equipment and proper surveying techniques. They joined us in the field on several of our survey projects to get first-hand experience on robotic operation and data collection techniques. When the opportunity to travel with them to Guatemala to work on a current archeological excavation arose, it didn't take my wife, Linda, and me long to sign on. It has always been a professional goal of mine to provide the surveying and mapping services on an active archeological project. While working in a foreign country with virtually no grasp of the language would have normally concerned us, we learned that Dr. Robinson and Dr. Bartlett had lived in Antigua for many years, had worked on this specific site previously and were very familiar with area and the owner of the land on which the dig was taking place. We flew into Guatemala City and drove west to our lodging in Antigua. Antigua was the third capital of Guatemala and served as the capital from 1543 to 1717. Antigua enjoys popularity amongst tourists from all around the world, no doubt a result of its charm and mild climate. Antigua is a World Heritage Site (1979) indicating it is of outstanding universal value. Our work began on Monday morning when we met with the archeologists for introductions and basis instruction in the use of surveying instrumentation. Our classes were held at the public Universidad de San Carlos de Guatemala (the biggest and oldest university in Guatemala). While the university has less funding than some of the other universities in the city, we were pleased to offer our expertise (and Dr. Robinson's equipment) to some very eager students, including a young lady who is the third generation of a Mayan family to become involved in archeology. 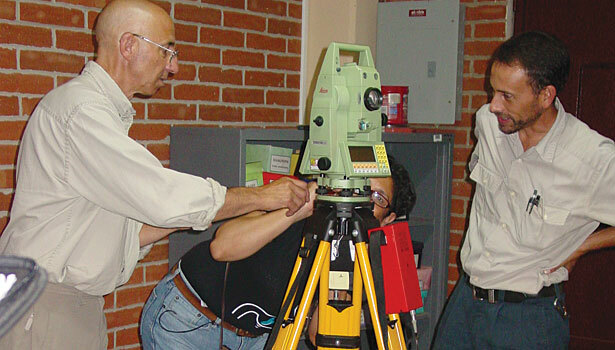 Over the next several days, we provided the basics of surveying techniques, the use of robotic instrumentation to log data, and general data collection principles. The instrumentation was a Leica TCRA 1102 Plus total station with an Allegro data collector. At mid-week, we traveled to the excavation site at Finca Pacaño, located in Patzicia, Chimaltenango, in the Guatemalan Highlands and about 120 miles west of Guatemala City to assist the team in practical application of their new skills at the dig site. Finca Pacaño is located on a mountain with a cave and numerous streams and springs. It is an area measuring approximately 600 meters by 600 meters. The discovery of two small pedestal sculptures of possible "dwarfs" dating to the Middle Preclassic period around 300 B.C. 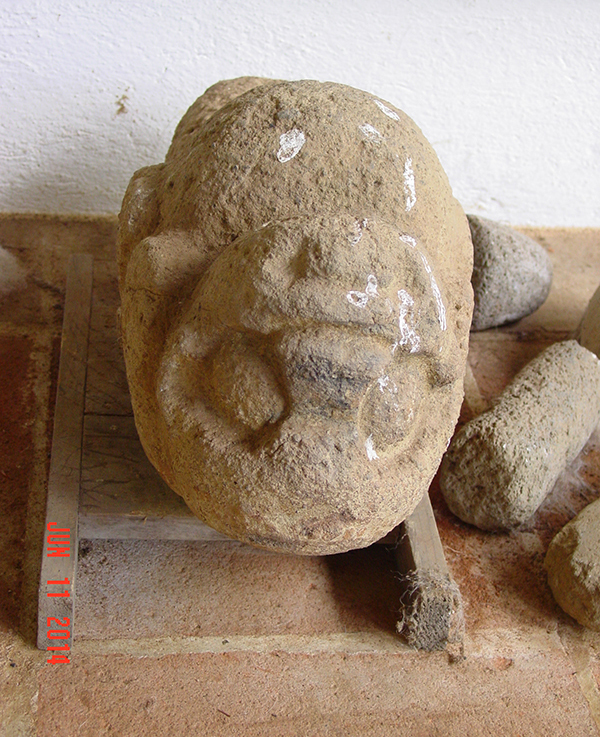 prompted previous archaeological investigation of the location to understand the context of the sculptures. Dr. Robinson's prior excavations found an extensive occupation in the Early Classic period (300-600 A.D.) around the cave. A buried stone slab with offerings of ceramics and obsidian blades indicate that ritual took place near the portal. Censer fragments and green beads from the edge of a platform may indicate there were rituals in possible elite households as well. 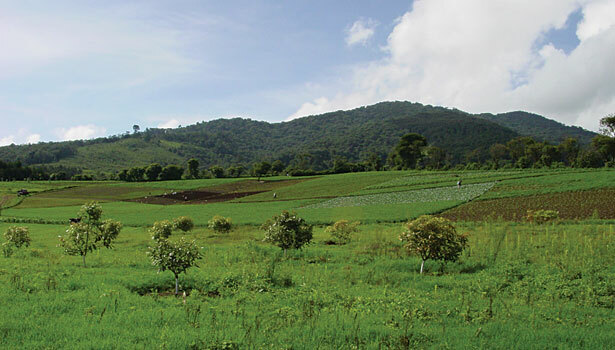 Subsequent to our visit, Dr. Robinson and Dr. Bartlett returned to Guatemala and to the Finca Pacaño with other members of the team to expand upon their measurements and feature locations of this archeological site. Our office continues to communicate with the team members to provide support for their ongoing work at the site. Alfred DiOrio, left, and students. Dr. Alfred Bartlett, third from left, on site with students. One of two small pedestal sculptures dating to around 300 B.C. Alfred DiOrio has been happily married to Linda for 23 years, He is president of Alfred W. DiOrio, RLS, Inc. which celebrated 35 years in business in September. He holds registrations as a PLS in all the New England states. DiOrio is also a seventh-degree Black Belt.